New Delhi: The Delhi High Court sought the Centres response on a plea seeking direction to frame appropriate guidelines for cesarean sections to safeguard the reproductive health rights of women and children. A bench of Chief Justice G Rohini and Justice Jayant Nath also sought to know from Medical Council of India (MCI) and the Delhi governments health and family welfare department if there is any guidelines regarding such procedure. The court asked the Ministry of Health and Family Welfare to file its counter before September 7 on a plea which also alleged that “absence of guidelines is leading to violation of reproductive health rights of women”. Advocate Vikram Srivastava, appearing for NGO Independent Thought, submitted that “complete absence of any regulation through law and the increasing rate of cesarean section deliveries based on extraneous considerations and in complete violation of the right to health and reproductive rights of all women in India”. The NGO has sought appropriate guidelines for conducting cesarean operations on pregnant woman and to regulate and monitor quality norms and standards therein in all hospitals in India. “Issue necessary directions to Union of India to bring on record the actual status and number of cesarean section deliveries in different states,” the plea said. It further urged the court to direct the governments to “constitute commission of inquiry on the circumstances in which the average birth by cesarean section in private hospitals of Delhi, is as high as 65.54 per cent, against 20.65 per cent in the government hospitals of Delhi, and where the WHO norm allowed for birth by cesarean section is between 10 to 15 per cent of the total deliveries”. There has been a consistent rise in the percentage of Cesarean Deliveries in the past 40 years .Many reasons , (a) More cesareans done to save babies , earlier on CS were done to save mothers .Modern investigations permit diagnosis of hostile intra uterine factors which can harm baby .Earlier on these investigations were not there . ( b) The demand for ZERO risk by the parents . (c) Fear of Consumer Forum . If there is fetal death and the question asked is ,” Could this child have been saved by a timely Cesarean ?”, I wonder how many Obstetricians will give a reply to the contrary ,( d) IVF babies . (e) Very good Neonatal Care Units . (f) Obstetrics is still not a “perfect” science . So much we learn every day to make us wiser . patients are refered to private hospitals only if they need a c-section. Normal deliveries are conducted at primary health centers or smaller district hospitals. The serious ones where the baby or mother are at risk are done at private hospitals. Indications for cesarean already exist and are being followed. Do you also have a God -Complex? You guys should be ashamed of yourself and the bs study you have done. Violating mums and babies , doing your so called life saving surgery to fill your pockets. Why do not you guys just ask for money , expecting families will happily throw the money at your faces if that’s what it will take you to back off! Shame shame. Cesarean section is need based delivery method for pregnant mother. There should not be any strict protocol. 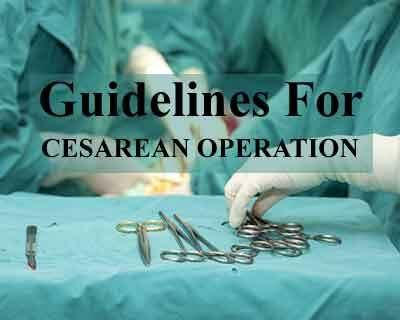 THER’RE VERY WELL LAID OUT GUIDELINES & INDICATIONS OF CAESAREAN SECTIONS IN EVERY STANDARD TEXT BOOK. THE COURT SHOULD NOT POKE ITS LONG NOSE HERE & LEAVE THIS TO THE MCI. INSTEAD THEY SHOULD INTROSPECT AS HOW BEST TO CLEAR THE BACKLOG OF MILLIONS OF CASES.